I went vegan as a stressed-out graduate student who cared about animals, the environment, and workers rights. At the time, my own health was the last thing on my mind-I was just trying to make it through all-night writing sessions by scarfing down French fries and cookies, and definitely didn’t think I had time to exercise. Almost as soon as I finished my degree and started working normal hours, I realized that I now had time to invest in myself, so I started going to the gym. My personal trainer was vegan too! She said since I was already eating plant based foods, I should be able to shed the extra pounds easily, and she was right! 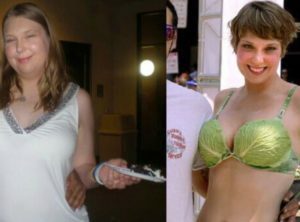 By eating unprocessed fruits, vegetables, and whole grains, I lost 70 pounds of weight that I didn’t need. For anyone who is looking to improve his or her health, I definitely recommend starting by going vegan-not only can it help those who want to lose weight to do so, but vegetarians also have lower rates of heart disease, cancer and diabetes. Plus, you’ll save water, reduce our carbon footprint, and save more than 100 animals every year.